Sometimes simple can be really hard to achieve. That point was made apparently clear as minutes turned into hours in the preparation of a “simple” spot prawn pasta recipe. Maybe I didn’t read the recipe carefully enough before-hand, which is a common problem of mine. If I had, I would have realized how many steps there was in building flavours that would be delivered subtlety so as not to overwhelm the delicate prawns. Maybe I should have taken noticed that it was a Rob Feenie recipe, and he’s known to put in so many additional steps which may or may not add to the final product. Since it was a Sunday and I’ve been training super hard and paddling almost every day, I thought I would indulge a bit and go “full on” with this butter-based sauce. I also opened up one of my whites from the Naramata bench, thinking that a BC wine really complement the BC Spot Prawns. The end result of pasta and paired wine was very delicious, but it took me over an hour and a half to prep this meal. I’m convinced that in half the amount of time, I’d be able to make just as satisfying. Seeing as I have a few more bags of prawns in the freezer, it’s a challenge I’ll be taking on soon. 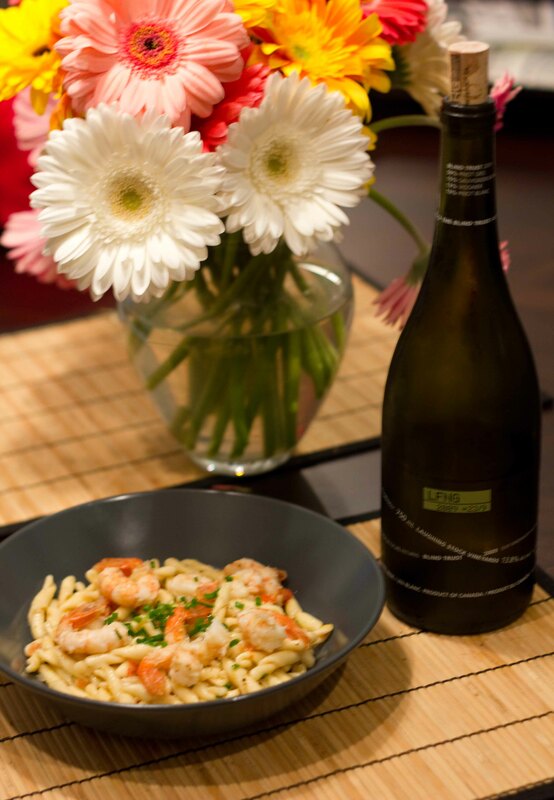 The Blind Trust white wine from Laughing Stock Vineyards with its tropically fruity notes paired well with the prawns and had the perfect acidity to cut through the buttery sauce. In a large pot of boiling salted water, cook the pasta to al dente stage. Strain without rinsing the pasta. Toss with a small amount of olive oil. Spread on a flat baking sheet to air-dry – this step allows the starch to remain on the pasta, which makes sauces cling better. You can do this ahead of time and store the pasta in resealable plastic bags. To make the sauce, combine vinegar, wine and 4 thyme sprigs in a small pot. Reduce to a syrupy consistency. Remove thyme sprigs. Whisk in the cream – this step will prevent the sauce from separating. Remove from heat and whisk in butter, a bit at a time. If sauce cools too much, return to low heat, but do not let it boil. When butter is incorporated, add lemon juice and zest along with thyme leaves to mixture. Season with salt. Keep warm. To make the pasta glaze, heat stock over medium in a large sauté pan, until reduced by half. Whisk in butter. Add the pasta and toss to warm through. Add tomato, chives, parsley and lemon zest, and season to taste with salt and freshly ground white pepper. Set aside. To prepare the prawns, season them with salt. In a non-stick frying pan, heat the oil over medium-high. When the pan is lightly smoking, add prawns and quickly sauté. When prawns are pink on one side, add butter, garlic and shallot. Turn prawns and continue sautéing until cooked through. Remove from pan and keep warm. Finally, to assemble, add the pasta and ¼ cup lemon and thyme sauce to the prawn juices. Toss over low heat until thoroughly warmed. Divide among 4 large bowls. Place 3 prawns on top of the pasta. Drizzle warm sauce on top of the prawns and around the plate. Sounds delicious Suzy. 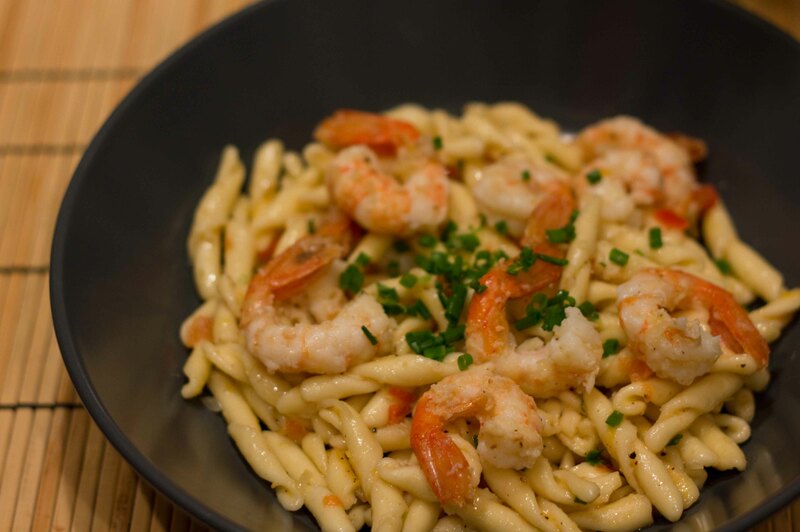 I made a roasted garlic & dill infused spot prawn pasta this weekend. Tis the season !! And the “official season” doesn’t start until May 1st… Your dinner sounds yummy too! I’m thinking about throwing some on the bbq tonight, lightly salted, shells on. Very Nice! Would like to try it out someday.